Replicate selected parts, faces, or features along a sketch curve (or series of adjacent curves, edges on solid parts, and edges on wire parts) in the order of selection. Create new parts or modify existing parts by adding or removing material, or intersecting parts in its path. 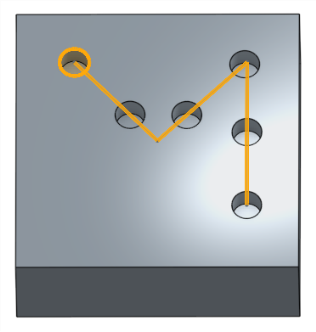 Curve pattern may also be used during an active sheet metal operation. 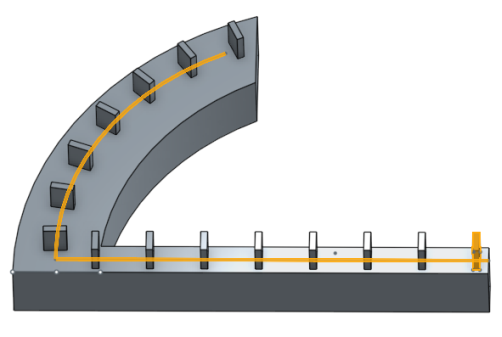 Feature - To pattern a specific feature (or features) listed in the Feature list (an extrude, fillet, sweep, sketch, etc.). Note that Feature does not work for sheet metal; see the Face pattern type for sheet metal modifications. With focus on the Entities to pattern field, select entities to replicate into a pattern. When selecting Faces to pattern, the Create Selection is useful to select related faces. 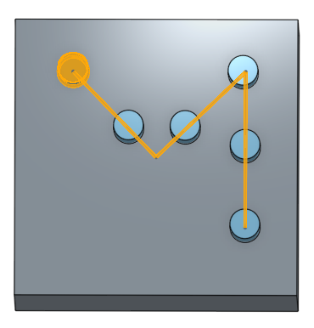 Set focus in the Path to pattern along field, and then select a sketch curve (or series of adjacent curves, edges on solid parts, and edges on wire parts) along which to place the replicated pattern entities. Enter the number of instances you want the pattern to have. 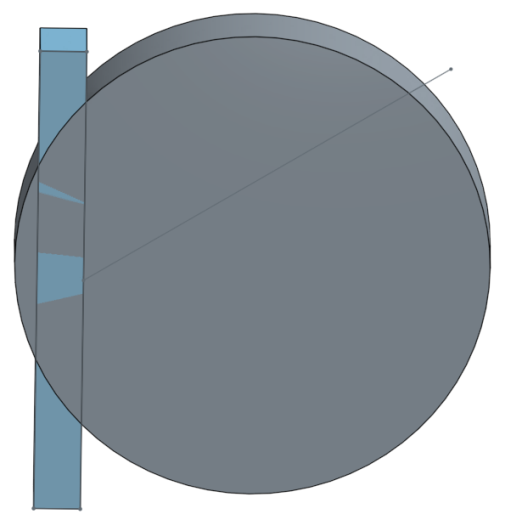 Use Keep orientation to preserve the original orientation of the part/face/feature being patterned. Select Apply per instance to regenerate the feature for each instance (specified in Instance count), in lieu of simply recreating the initial pattern instance. You are unable to set a distance between entities in the curve pattern, but you are able individually delete any entities after the pattern is complete. Pattern a specific feature (or features) listed in the Feature list (an extrude, fillet, sweep, sketch, etc) without Apply per instance selected (a faster, more lightweight feature pattern). This is not available for sheet metal. Pattern a specific feature (or features) listed in the Feature list (an extrude, fillet, sweep, sketch, etc) with Apply per instance selected. This is available for sheet metal. Pattern a specific face on a specific part. Leave material only where geometry overlaps. 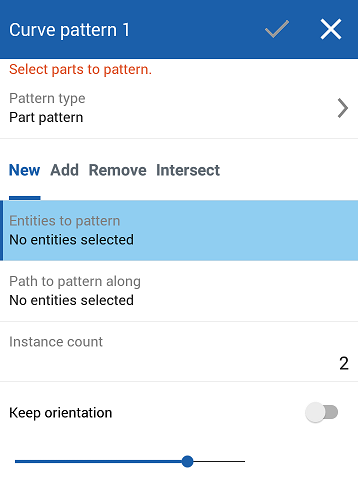 When patterning a feature, you can select anything in the feature list, in any order. Regardless of the order selected, the features are applied in the order listed in the Feature list. If you select a pattern in the Feature list, you will pattern that pattern, but not the seed. In order to get the seed included, select it as well. When patterning a boolean feature (Boolean, Split, etc), you must also select the features the boolean was applied to. 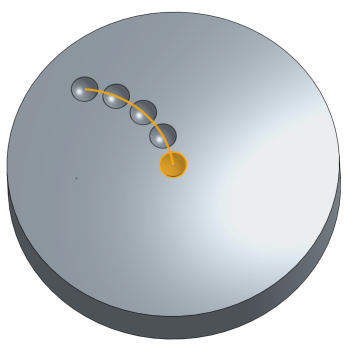 You are unable to set a distance between entities in the curve pattern, but you are able to individually delete any entities after the pattern is complete. 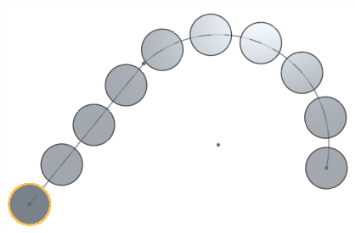 If you use more than one sketch curve (or edge on solid parts, or edge on wire parts) to direct your pattern and it does not result as expected, try selecting the sketch curves in a different order. 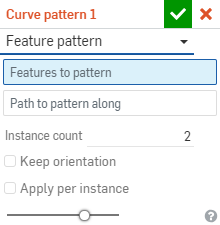 Set focus on the Path to pattern along field, and then select a sketch curve (or series of adjacent curves, edges on solid bodies, and edges on wire bodies) along which to place the replicated pattern entities. 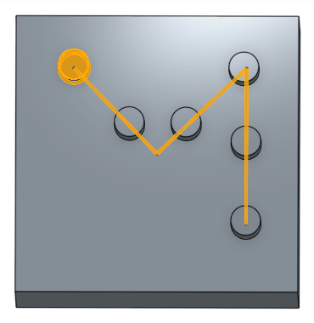 Toggle on Keep orientation to preserve the original orientation of the part/face/feature being patterned. A part was patterned along two adjacent sketch curves 10 times, creating new material. Pattern a specific feature (or features) listed in the Feature list (an extrude, fillet, sweep, sketch, etc.). An extrude feature was patterned along two adjacent sketch curves 15 times, adding to the existing material. A face was patterned along one sketch curve 5 times to remove material from the existing material. New - Create new material that results in a new part. Add - Create material and add to the existing material (in this instance, Merge with all was selected). Take material away; select the part to pattern and then Remove. 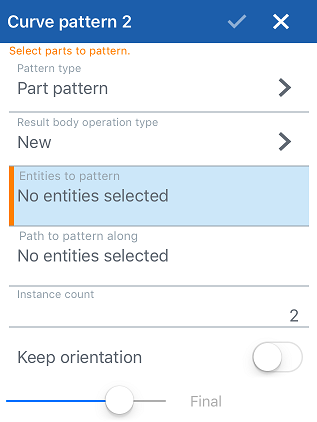 When patterning a feature, you are able to select anything in the feature list, in any order. Regardless of the order selected, the features are applied in the order listed in the Feature list. When patterning a boolean feature (Boolean, Split, etc. ), you must also select the features the boolean was applied to. 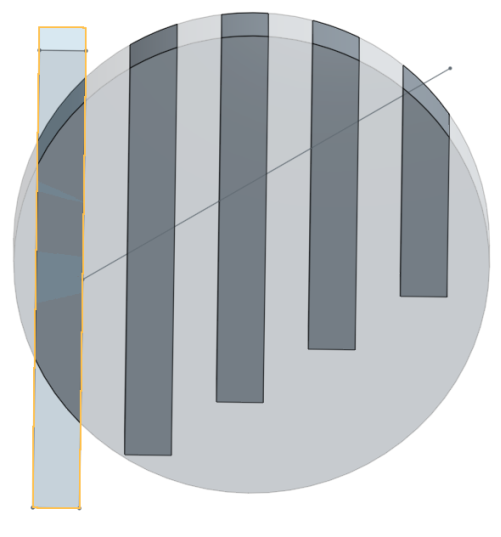 If you use more than one sketch curve (or edge on solid bodies, or edge on wire bodies) to direct your pattern and it does not result as expected, try selecting the sketch curves in a different order.